6-in-1 solar kit is an amazing way to educate children (and adults!) on how solar power works. It\'s also great brain stimulation for the mechanically minded. 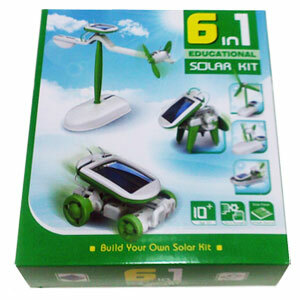 This kit comes with plastic pieces that make a solar airboat, windmill, puppy, car, plane and revolving plane. The age recommendation is 10+, but bright children who are younger will be able to do at least some of the building on their own or at least the attempt may bring them a sense of accomplishment and independence. An additional plus is that the kit is totally reusable and may be re-assembled into its different variations many times over, if none of the parts get lost! If the sun is hiding when you want to use the kit, it should work just as well under a light bulb!